Whether you're looking for inspiration to tackle your own period property renovation project or just fancy a look around a cute country cottage, we're sure you'll fall in love with this renovated thatched holiday cottage. Once you've had a look, browse more of our gorgeous real home renovations. Read our guide on renovating a house, too, for more guidance. Property prices were on the rise, though, and Norfolk seaside homes were edging beyond Alison’s budget. A friend suggested she consider the largely undiscovered Lincolnshire coastline, around Anderby Creek, so she headed north. Hill Farm Cottage, not far from Louth in the heart of the Lincolnshire Wolds, was the result: a two-bedroom, early-18th-century thatched house, with a pretty garden surrounded by gently undulating countryside. ‘When I first walked inside the cottage, it hugged me and instantly I knew I had found my gem,’ she says. The property had belonged to an antiques dealer and his wife, and when Alison viewed it, it was difficult to see round the heaps of antique furniture crammed into the tiny rooms. Yet she knew that with a lick of paint, and some minor repairs here and there, she could soften and refresh the look of her slightly tired new home. Alison loves to collect furniture from antique centres, junk shops, and family, often painting them in soft, chalky tones to give them a new look. As you come into the house through the kitchen, you see three such pieces – the butcher’s block, pantry cupboard and corner cabinets, which combine for the perfect unfitted look, along with the Aga Rayburn and flagstone floor. In the dining room, the impression is of an almost circular space, accentuated by the ‘witch’s hat’ fireplace, typical of the area. Alison still needs to carry out further repairs to get this into use, but for now it makes a quirky focal point in this cosy room. When she’s ready to make those repairs, she knows just the man for the job: Robert E Ley, a local woodworker and artisan craftsman, who is no stranger to the cottage, having restored it eight years and two owners ago, following a fire. The yellow-brick Victorian addition to the cottage, which houses the downstairs bathroom and living room, took the brunt of the fire, and so Robert had new bricks made by the original brickyard, still in existence, to replace those damaged by the heat and smoke. Beautifully restored, the living room is now a comfortable space, to which Alison has added feminine accessories, with a sofa and paintings. Flora the labrador is getting used to her two homes and, like Alison, relishes the long weekend walks and the occasional paddle at a nearby beach. 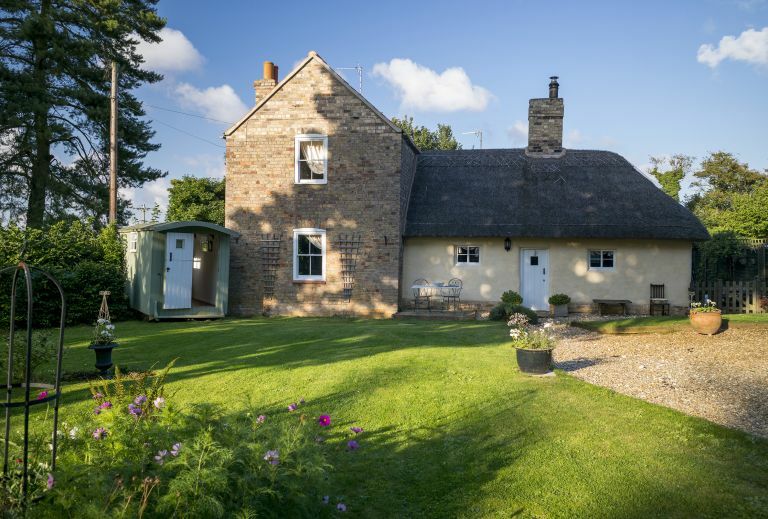 However, once the Grantham house is finished, Alison plans to use Hill Farm Cottage as a holiday let, so that other people can enjoy the calm and unspoilt views from this gem of a cottage in the Lincolnshire Wolds. And then, perhaps, she might finally be able to buy herself that coveted diamond ring. Looking for more country cottage renovations?